We love our youth at St Peter’s! They bring so much to our church community. We seek to help them to become rooted in Christ and fruitful for Him in their lives. There are two opportunities every Sunday for secondary aged young people to meet together. SPY (St Peter’s Youth) meets during our 10.30 am service at Eastgate. We begin all together in church and then go down to St Peter in Eastgate School to loo at the same Bible passage as the adults but in a more interactive way and with breakfast too! SPY (St Peter’s Youth) also meets on a Sunday evening. 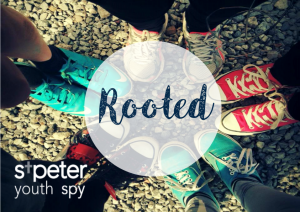 SPY PM for Years 7-9 meets for fun, food and food for thought every Sunday evening in term time from 6-7.30pm at Marriner Crescent. We have a great fun theme every week. Check out our facebook and instagram accounts for further details. SPY PM for Years 10+ meet during the 6pm evening service for DVD & discussion on the big questions of life and faith! In addition to our regular groups, we have outings and other socials throughout the term and we lead a youth worship night too. All leaders of activities involving children, young people or vulnerable adults are DBS checked and appropriately trained. Further details of our safeguarding policy here.